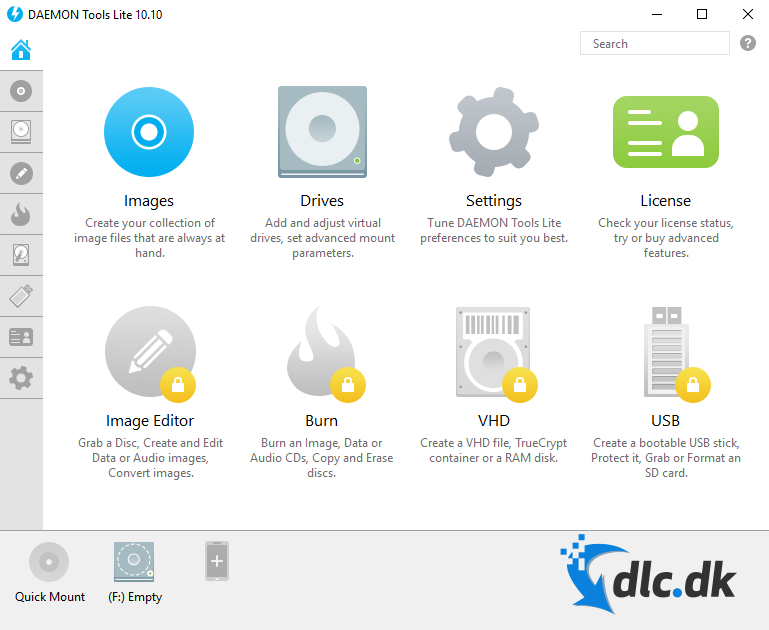 Download DAEMON Tools Lite here for free. In the past, all PCs and laptops contained a disk drive that could read CDs and DVDs files. These files are called ISO files and are also available on CDs and DVDs on Blu ray discs as well. Today, however, the disk drive has been removed in many newer models to make room for larger hard drives, or to make the computer lighter and smaller. DVDs and CDs have been replaced with streaming services, and many therefore see no reason to have the disk drive anymore. Unfortunately, this also means that your computer does not contain the tools needed to read ISO files from the start. This is where DAEMON Tools Lite enters the picture. 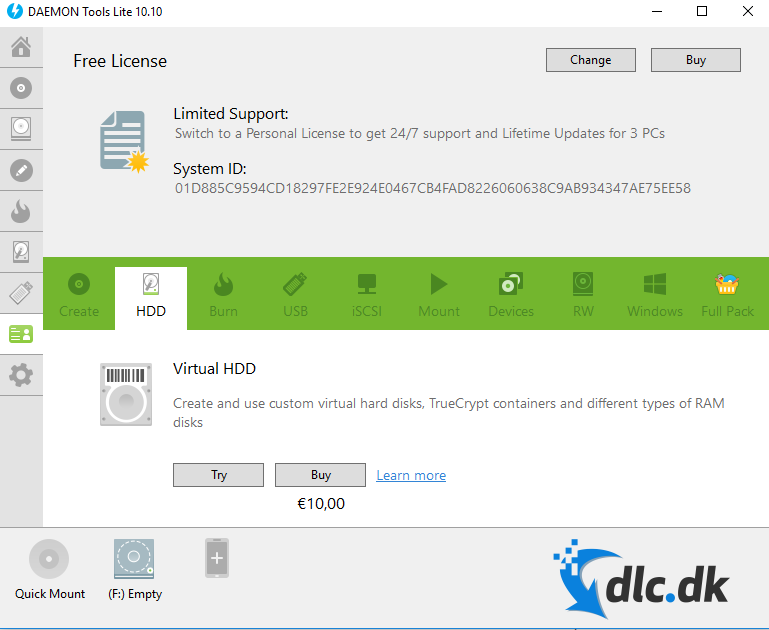 The DAEMON Tools Lite program can create virtual CD / DVD drives that allow you to play ISO files that you either downloaded or copied to your computer's hard drive. Your system understands the virtual drives as physical, but they work much faster than physical drives, while also occupying much less space, and even using much less of your computer's energy than the physical disk drives do. When it is said that the computer thinks that the virtual drives are physical, it means that DAEMON Tools tools make your computer think that the ISO file you want to play is in a CD / DVD drive and not lies like a downloaded file on your computer. It is therefore a good idea to make use of DAEMON Tools Lite if you want to play ISO files. The edition you can download here on the site is a completely and completely free version of DAEMON Tools Lite. This includes all the features mentioned on this page, while you can upgrade to the paid version, which unlocks a wider range of features and options. For example, in the paid version you can also burn data discs, audio files, etc., while you can also access a number of Windows integrated functions. However, this is entirely up to you, and the developers behind the program do not push you to upgrade. The free version of the program comes with a number of advertisements, which are the way they make money without having to pay a penny. With the free version of the program, be sure to update the program yourself whenever you want. The paid version, by contrast, updates itself, which is a great advantage for many. 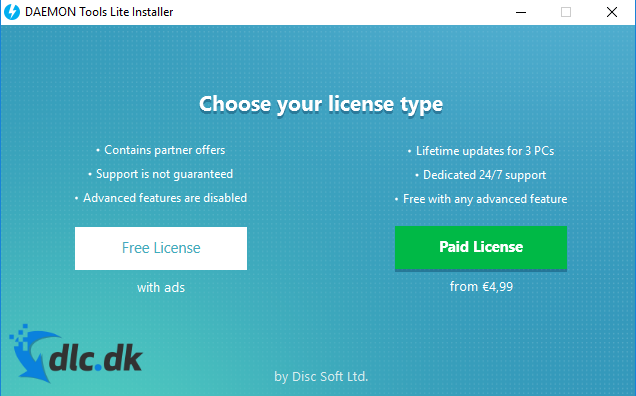 When you download DAEMON Tools Lite, you are prompted to decide whether to purchase or start the free version. Here, press the Free License if it is the version of the program you want to use. If you later find out that you want to upgrade to the paid version, you can do so in the program under the License menu. When you download DAEMON Tools Lite and the program is installed, you will be asked if you want an introduction to the program and its features. Thus, you can be guided through all facets of the program and its possibilities, which can be a great help for many, as a program like this may seem very technical at first glance. The program can be installed in a lot of different languages, but unfortunately Danish is not yet one of these languages. Therefore, as a Dane you have to use the program in English, which for some can make it complicated. Fortunately, the introduction is very helpful, and everyone should therefore be able to participate. DAEMON Tools Lite is not the only edition that the developers behind. You can also take a look at DAEMON Tools Pro and DAEMON Tools Ultra. You will find them on the developers' websitee . If you want to take a look at the many alternative programs that we make available on this page, you can find the entire selection by clicking here . 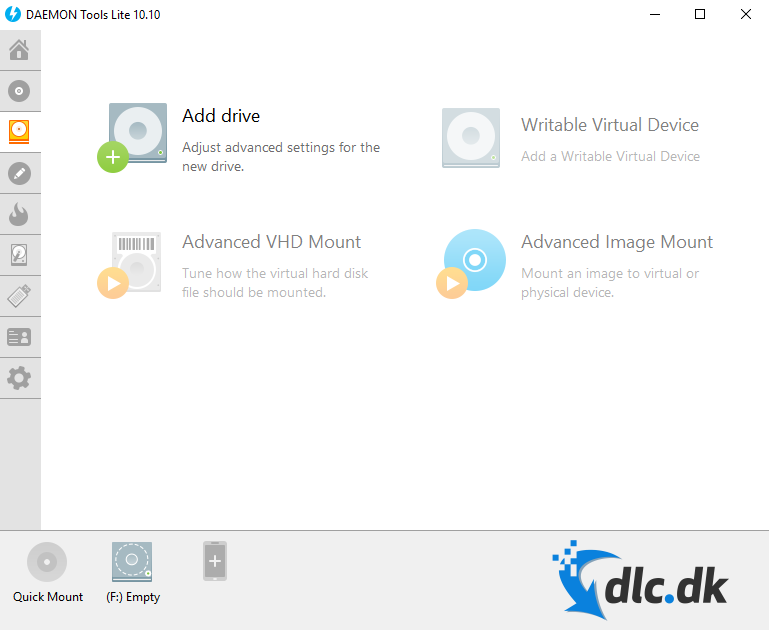 DAEMON Tools Lite is designed to create virtual disk drives on computers running on a Windows operating system. For example, if you are either a Mac or Linux user, you need to find alternative programs. DAEMON Tools Lite is a great application for those who want to play ISO files on your computer but who do not have a CD / DVD drive. The program creates virtual disk drives that you can play through your CD and DVD files, which solves a problem many have today, where disk drives have been removed or replaced in newer portable models. In addition, the virtual drives are faster than the physical, while also using less of your computer's energy. The program is free to download and therefore you can freely try it out without any costs or consequences. When you download the program, you can choose from the free version of the program and a paid version of the program. 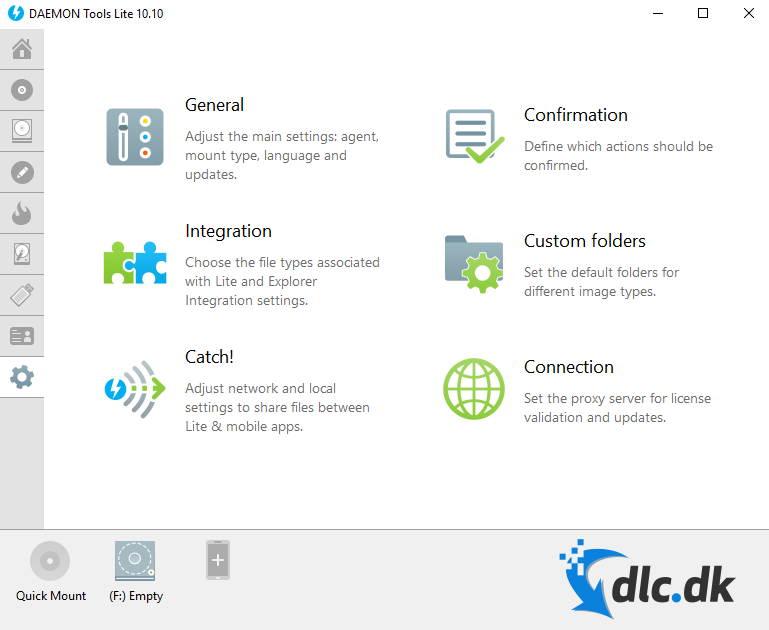 The paid version of DAEMON Tools Lite contains a number of extra features that are worth taking a look at. In addition, the paid version also contains no advertisements, which one finds in the free edition. It is therefore up to you to find out and decide which version of the program you need.